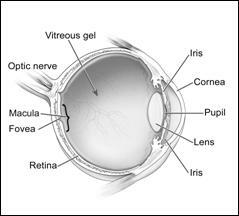 Age related macular degeneration, also known as AMD, is a degenerative eye disease of the blood vessels located in the macula which is part of the retina. The macula is responsible for our sharp, central vision. AMD is a major cause of severe central vision loss in Americans aged 55 and older. The most notable symptom of macular degeneration is blurry or distorted central vision. A person with AMD may experience blurry words on a page, distortion at the center of vision, a dark or empty area in the center of vision, or the distortion of lines. Unfortunately, there is no complete cure for AMD at this time. The main goal of treatment is to delay progression and sometimes improve vision. Treatment is dependent on whether the disease is in the early stage, also known as dry AMD or the advanced wet form, which can cause severe vision loss. There are no FDA approved treatments for the dry form, however; specific vitamin supplementation may be valuable in preventing progression to the wet type. For Wet AMD, treatments are directed towards stopping the growth of the affected blood vessels through FDA approved treatments such as laser photocoagulation, photodynamic therapy, and direct injection of Anti-VEGF medicines in the eye such as Macugen or Lucentis.